The Pentecostal Evangel, the weekly magazine of the Assemblies of God USA, has been one of the most prominent Pentecostal periodicals in the world. 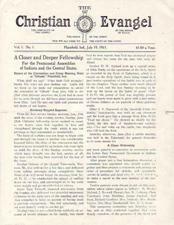 J. Roswell and Alice Flower started the publication in July 1913 as the Christian Evangel, which served primarily a small regional Pentecostal network of churches, known as the Association of Christian Assemblies. In April 1914, J. Roswell Flower helped to lead this network into the newly-formed Assemblies of God. He was elected to serve as the first secretary and gave the Christian Evangel to the Assemblies of God, just as E. N. Bell (the first chairman) also gave his periodical, Word and Witness, to the Fellowship. The first issue (July 19, 1913) of the Christian Evangel featured interracial content (three articles were by or about Garfield T. Haywood, the African-American pastor of the largest Pentecostal congregation in Indianapolis). The first masthead read "The simplicity of the gospel, in the bonds of peace, the unity of the spirit, till we all come to the unity of the faith." This language, which affirmed the possibility of spiritual unity despite a lack of "unity of the faith," found its way into the preamble of the organizational document of the Assemblies of God. Publishing the Christian Evangel on a weekly basis was quite an undertaking. The name was changed to the Weekly Evangel in 1915, drawing attention to this fact. On January 1, 1916, Word and Witness merged into the Weekly Evangel. The title changed back to Christian Evangel in 1918 when Gospel Publishing House moved to Springfield and the publication frequency became biweekly. In 1919 the current title, Pentecostal Evangel, was adopted. The magazine returned to weekly publication in 1923. The Pentecostal Evangel, particularly in its earlier decades, was a rich source of theological essays, news articles, missionary letters, and revival reports. The Pentecostal Evangel is one of the essential primary sources for the study of the Assemblies of God and the broader Pentecostal movement. Visit the Pentecostal Evangel website for selected articles since 1999: www.pe.ag.org. NOTE: Access to issues of the Pentecostal Evangel from 1970 to 2002 are only available to registered users at iFPHC.org. Some early issues of the Pentecostal Evangel have not yet been located. If you possess issues (prior to 1940) that are not on this website, please contact the Flower Pentecostal Heritage Center at archives@ag.org.